This Contour Inflatable Sanding Drum is an ideal choice for sanding flat or near-flat surfaces (when inflated to its maximum 15# psi pressure) -- or for shaping and smoothing contoured shapes (when inflated to a low pressure). 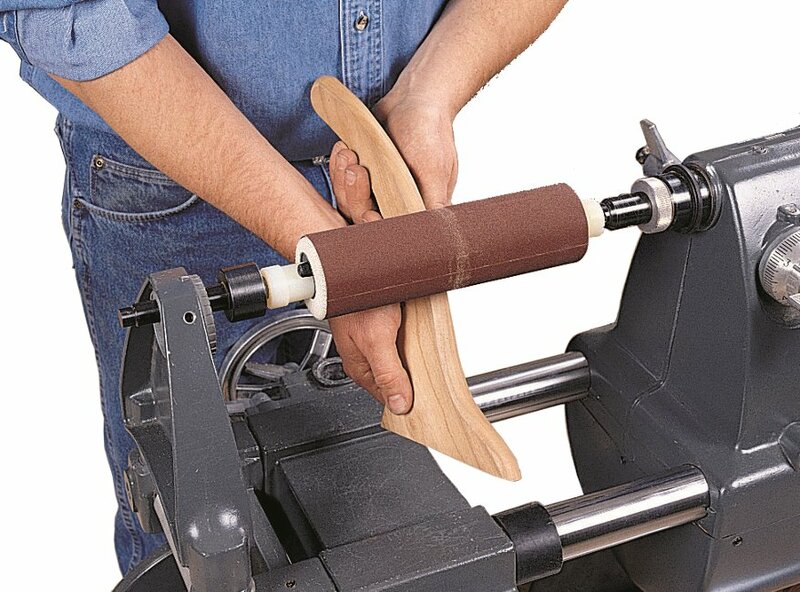 Just mount the 2-1/4-inch diameter x 8-inch long sander between the centers of your Shopsmith's lathe (Tailstock live center, 505602 required for use) -- inflate it to the pressure you want (up to 15# psi) with a bicycle pump -- and you're ready to go to work. It's the perfect choice for shaping and smoothing cabriole legs, bandsaw boxes, stair balusters and more. Start with a coarse (80-grit) sleeve and move through progressively finer grits until your project is smooth and ready-to finish. Made with a heavy canvas covering over a durable, inflatable rubber drum, it features metal end plates with tough polymer end mounts that won't damage your lathe centers. Includes one 100-Grit (medium) aluminum oxide sanding sleeve.